Dr. Myers lives in Springdale with his wife Martha Ellen and their son Jake, born August 18th, 2004. He is a 2001 graduate of Southern College of Optometry in Memphis, Tennessee. Dr. Myers was raised in Huntington, West Virginia where he attended Ceredo-Kenova High School. He earned a Bachelor’s Degree in Biology from West Virginia University and attended graduate school at Marshall University. He and Martha Ellen were married in her hometown of Pocahontas, Arkansas in June of 2001. They moved to Springdale in July of 2001. 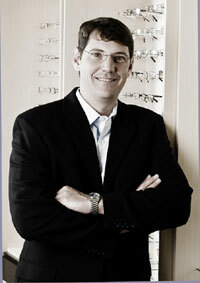 Professionally, Dr. Myers is a member of the Arkansas Optometric Association and the American Optometric Association. His community involvement includes membership and participation in the Springdale Rotary Club, the First United Methodist Church of Springdale, and he serves on the board for the Economic Opportunity Agency of Washington County.